Traditional Chinese Medicine (TCM), a combination of Acupuncture and Chinese Herbal Medicine, has made great strides in the last fifteen years, and is growing in popularity throughout the world. It is a very exciting time for TCM practitioners and patients as more and more people are making it part of there well being. New ideas and understandings about TCM are emerging everyday, which make this powerful and effective medicine a reliable choice for all of our clients. The power of herbs and acupuncture is phenomenal, being able to heal an enormous variety of conditions. In the past, this field of healthcare was largely ignored due to a lack of understanding. Over the years, a large amount of medical research has continuously demonstrated its effectiveness. People who have had the experience of traditional western medicine failing them, often turn to TCM and are surprised to see great results! Eastern Medicine certainly has its place in today’s healthcare. If this approach to wellness is new to you, we urge you to read as much about it and ask as many questions as possible to heighten your knowledge and comprehension. The informed and empowered healthcare consumer is the one who understands the importance of following through with a custom tailored healthcare program for their specific problem. Whether your concerns relate to infertility, complex skin or digestive disorders, or any other problem you may be experiencing, strongly consider TCM as a solution to your problem. It has helped many of our clients, impacting their lives in the most positive way! This could very well, also be the answer for you. Can this Ancient Art Help? Chinese herbal medicine has been helping people around the world for thousands of years. It is a well developed and systemized medicine that is based upon theoretical principles as a means of both the prevention and treatment of illness and disease. Complex systems of diagnostic methods take into consideration the person as a whole, not just isolated symptoms. Chinese Medicine provides a comprehensible framework, which describes a pattern of symptoms from which people can suffer. A “pattern of disharmony” is discovered and treated accordingly. This could be very empowering to the patient, who may for the first time understand what is causing their illness, increasing both the ability to function and their quality of life. Chinese Philosophy and Medicine is a whole new way of looking at one’s health. The restoration of balance is a main focus in Chinese herbal medicine. Chinese medicine is not just about alleviating symptoms. More importantly, it focuses on assisting the body to cure itself. The Chinese believe that the first step to good health is to acknowledge that it lies in our own hands, and by being aware or our surroundings and our internal harmony, we can often help ourselves cure minor problems before they become major problems. Chinese Medicine assists in the process of understanding yourself and the way your body works. Many people in today’s society believe that they are in good health because they do not suffer from a disease. Also, many people rarely see their doctor, but it does not automatically mean that they are healthy. Real health is more than the absence of pain and suffering. It is a sense of happiness, joy and fulfillment, and an appreciation of living. Chinese Medicine believes that in order to reach this healthy state, one must take full responsibility of their health. There are many different parts of our lives that contribute to our overall health. Chinese Medicine helps an individual look at the big picture, showing us that health problems cannot be viewed in isolation. This means that each part of an individual – their physical, emotional, intellectual and spiritual dimensions are equally important, and imbalances in any of these areas can contribute to illness. We strongly recommend that everyone develop a good relationship with a Chinese Medicine practitioner in order to achieve holistic health. It is an approach that goes far beyond the physiology of Western Medicine. What is all this about Yin and Yang? 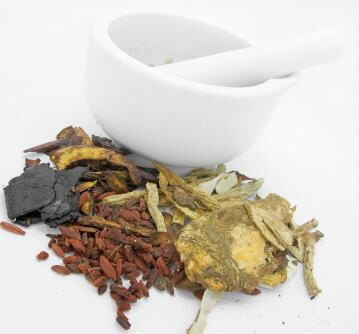 In China, Herbal Medicine is the main treatment method within Traditional Chinese Medicine. Although Acupuncture has been one of the first Chinese methods of treatment to gain acceptance in the West, we are beginning to see Chinese Herbal Medicine become a more popular choice especially with “difficult to treat” diseases. Chinese Medicine is the world’s oldest, continually practiced professional medicine which dates back over 2,000 years. Chinese Medicine is based on the theory of Yin and Yang. A theory where the ancient Chinese attempted to describe the forces that surrounds us. Yin and Yang is a well known concept around the world but also probably the most misunderstood. It can be applied to all aspects of life. The idea surrounding Yin and Yang is that everything is based on mutually dependent opposites, with each supporting the other. Therefore, for example, the concept of “hot” has no meaning without a concept “cold”, the concept of “up” has no meaning without the concept of “down”, and so on. The interdependence of Yin and Yang shows the extreme interaction between the two. If Yin or Yang is prevented from reaching balance or harmony between this mutual interaction, the consequences may be catastrophic. For example, if someone presented with a fever, then this is seen as excess Yang in Chinese Medicine. The principle of treatment would be to try and bring the body back to balance by transforming excess Yang into Yin in order to establish a state of homeostasis. This means that the fever would diminish and the body temperature would begin to return to normal. Chinese Medicine has always viewed the body in terms of Yin and Yang aspects. A harmonial balance between these Yin and Yang aspects of the body is characterized by good health, while poor health is indicative of some imbalance between the Yin and Yang aspects of the body. Basically, all imbalances can be condensed to a pattern of disharmony of Yin and Yang. Chinese Medicine is a medicine that focuses on prevention. The ideal for any system of medicine is to prevent illness and disharmony from arising in the first place. In this respect, Chinese Herbs and Acupuncture does have something to offer those people who are concerned about staying healthy. In the hands of an experienced professional, acupuncture and Chinese herbal medicine has been proven to be safe and effective when administered correctly and it is a very potent means in the maintenance of health and the curing of disease. Chinese Herbs appear extraordinary and foreign to us in the West, and at first we might find their smells and tastes unusual or unpleasant but over time people do adjust and become accustomed to taking them. Chinese Medicine is often expressed in terms of the two complementary forces – yin and yang; and the five elements – fire, earth, metal, water, and wood. The five elements give rise to the five tastes by which all medicinal plants are evaluated. Fire gives rise to bitterness, earth to sweetness, metal to acridity, water to saltiness, and wood to sourness. Each taste is said to have a particular medicinal action; bitter-tasting herbs drain and dry; sweet herbs tonify (dampen) and may reduce pain, acrid herbs disperse; salty herbs nourish the kidneys; sour herbs nourish the yin and act as astringants, preventing unwanted loss of body fluids or Qi. Herbs that have none of these tastes are described as bland, a quality that indicates that the plant may have a diuretic effect. The taste of a plant can also indicate the organ to which it has a natural affinity. Besides defining particular herbal tastes, the Chinese ascribe different temperatures to herbs – hot, warm, neutral, cool, and cold. Each individual herb has different properties such as taste and temperature, and enters different organs in the body. When the herbs are combined, through mutual harmony, the treatment effect is increased and the side effects reduced. A usual prescription or formula can consist of multiple herbs. After a diagnosis is made, herbs are selected and combined, or a well- known traditional formula is prescribed. The formula is adjusted to fit the patient’s symptoms and diagnosis. The formula brings about the treatment effect by regulating Qi (Energy), blood and body fluids, which are fundamental substances that form the body. This gives total harmony and balance to the whole body, helping to correct and rebalance the flow of energy and consequently relieve pain and/or restore health. When the flow of energy is blocked for any reason, there is disruption of health, resulting in pain and illness. When the energy is released and regulated, health may be restored. Is there a difference between Western and Chinese approach to herbalism? Western herbalism primarily treats diseases or symptoms, such as fever, diarrhea, abdominal, etc. and it focuses on one symptom or disease at a time. Chinese Herbal Medicine is based on pattern discrimination. Through the four diagnostic methods: Looking, Hearing and Smelling, Questioning, and Touching, information will be revealed that will contribute towards building a comprehensible whole. This information which is gathered through the four examinations is also referred to as the individuals’ patterns which is made up of your signs and symptoms. Once the individuals’ patterns are determined, then the practitioner modifies and fine tunes the herbal formula in order to match the person’s disharmony. The result is a formula tailored to the individual’s pattern designed to treat their symptoms and disease. What are the benefits of taking Chinese herbal medicines in liquid form? In this method, herbs are cooked with water for up to two hours. This is the strongest way of taking the herbs because most of the volatile oils are contained. It also permits greatest flexibility in writing a prescription. A treating practitioner can modify the prescription at any time so it can best suite the patients’ pattern. A disadvantage is that it could become a laborious and expensive process because large amounts of herbs are usually required for maximum results. Also, it could be strong tasting and often unpleasant to Western palates. Traditional Chinese Medicine treats a wide variety of diseases ranging from acute conditions such as the common cold and back strain to more chronic conditions such as autoimmune disorders, gynecological conditions and even cancer. Chinese Herbal Medicine tries to bring the person back into balance and consequently restore the harmony of health. It is also effective for promoting self healing and helps the body recover quicker from childbirth, stress, illness and most surgeries. Most recently the World Health Organization recognized that Traditional Chinese Medicine is very effective in treating many types of diseases. Yes, if the TCM prescription fits the pregnant mother’s patterns then there is absolutely no problem for pregnant women to be taking Chinese herbs. Many herbs are forbidden in pregnancy but others are especially good for pregnant women. Remember – if you are pregnant, tell your practitioner, and only take herbs that he or she has prescribed. Do not attempt to treat yourself using Chinese Medicine. Traditional Chinese Medicine has effectively treated pregnant women and problems specific to women and births for thousands of years. Can children and babies take Chinese herbs? Chinese Herbal Medicine can be very effective for children and babies. Children’s dosages are usually half or a quarter of those for adults. Pediatrics is a specialty within TCM and it has been effective in treating a variety of children’s disorders for centuries. There are ways of encouraging children to take the herbs, either by involving them in the preparation of the prescription, or by sweetening it with honey, or by offering a cookie. How long does it take for Chinese herbal medicine to work? In acute conditions; results may occur immediately. In chronic conditions, results do take longer, however signs that the medicine is working usually are noticeable from the very start. If you are not living to your maximal potential regarding optimal health, consider TCM. Life is too short to be sluggish or full of anxiety or to experience any type of pain or discomfort. Take control of your life and start incorporating TCM to your daily routine to get yourself balanced. Everything starts with a few small steps. If you have any questions, please do not hesitate to call us or send us an email anytime.